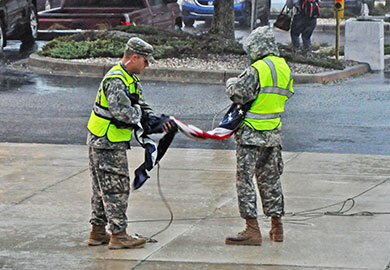 Strong winds blew the flags off of the pole at SEOC. A cyber scam is currently underway across the southeast coast. If you receive an email claiming to contain updates on power outages, do not click on the link unless you know the person who sent the email. Clicking that link allows the hackers to access your computer and steal your personal information. County curfews are still in effect and residents are asked to abide by those curfews for their own safety. There are currently 6,651 residents in hurricane shelters. Shelters in Jasper, Richland, and North Charleston being the fullest. There are currently 437,000 power outages across the state, most of which are in Beaufort, Charleston, and Richland counties. The Waccamaw River is expected to crest within a few days. Officials are monitoring it. Cell service is down on Pawley’s Island.